For those of you who have visited Paris, Copenhagen or D.C. and have been enamored of their bike sharing programs, you'll probably be excited to hear that Seattle is beginning a similar program of our own. These bikes are equipped with GPS so they can be found if "misplaced" from the rental station. You also need a credit card to check out a bike and it has special sensors on it to make sure the tires are inflated properly before you can remove it from the station. So, even though the theft of bikes might be an issue in other areas that have these programs, I suspect that unless a renter has a pocketful of stolen credit cards, it's unlikely they'll be stealing these bikes. The only downside to this much technology is that the bikes aren't exactly light. And this can be a big problem here in hilly Seattle. Finally, with Paris eyeballing a car-sharing program, Autolib', with a fleet of 4,000 electric cars, could something similar hit the states in the near future? I think I would still be more apt to rely on public transportation rather than the bikes, mostly because I'm a complete wimp about riding in dense traffic. Riding a bike in a bike-friendly European city is one thing. Riding it in crazy traffic with no bike lanes is another. We have a low-profile bike sharing program here in Keene, NH. It seems primarily geared towards the college students, but anyone is welcome to use it. There are donated bikes that have all been painted green and you check them out with your city library card or college ID. You then return them to either the campus or the city library, which actually aren't that far apart. Yes, it only benefits those who live downtown already, but it is a start. My brother went to the University of Maine in Orono and said they had a bike share on campus. Didn't cost anything, and you didn't officially "check out" a bike. They just knew which bikes they were, all painted the same color. People ride them from building to building, and just leave them in the bike racks. At least that's how it worked when he was there a few years ago, don't know now. I'm skeptical of how it would work in our culture, there is talk of having to have a membership before using them, here, which totally counteract the idea of getting people on bikes for short trips. We have car share, Zipcar but they are not electric, some are hybrids. Although I guess the city is getting a fleet of electric cars though with stimulus monies. and as to riding in traffic, (I know,I am in Portland...I understand that caveat entirely) but bike lane or no bike lane, I ride in traffic. It only seems scary until you get used to it, like lots of new things. It takes practice. It took me 5 years to go completely car free. That means I also get groceries and move furniture by bike and any other thing you can imagine. Even commuting by bike is a shift in how one views thier world though, it's not an easy shift at first. Seattle is hilly though, can't argue with that. I am still not fond of riding up hills! Hope Seattle's program pans out. I am skeptical of ours if they make it membership driven like Zipcar..I just don;t think it will get the use by tourists and the like that way...arrg. 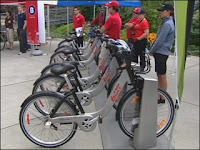 Are the seattle bikes the bixi bikes in your picture? I'm visiting montreal, and they have them here- I've been trying to come up with an excuse to use one, but I'm a bit afraid of the drivers here. The bikes seem like a really good idea, though I think they are only 3 speed, which could be frustrating in hilly Seattle. One way to claim space in traffic while bike riding is to look unusual. David Engwicht discovered that, after putting a pair of devil horns on his bike helmet for Halloween, he got a lot more space on the road, and he left the horns on his helmet year-round. I have a recumbent, and people give me more room than before because they can't figure out how wide my bike is. BTW, Engwicht is the author of "Mental Speedbumps," www.mentalspeedbumps.com, a book about traffic calming, and is a wonderful speaker. Orchid Black - If that's the case, then I better start riding around in this thing. (NSFW) Guaranteed not to get run over? We started a bike sharing program in the Short North Arts District. The next step is to get a bike lane or allow bikes on the sidewalk. It's a crowded area and cars don't like to share the road with bikes. To be fair, there's construction going on so there's not a lot of extra road to share right now.